It’s time to take another dive into the wonderful world of home education methods! So far we’ve explored Century-old methods, like Charlotte Mason and Classical Education; and, even more modern approaches like the eclectic/relaxed method. Now it’s time to explore another turn of the century method that some homeschoolers continue to benefit from: Waldorf Education. This educational method was named after the first school in Germany that adapted the philosophy of Austrian educator, Rudolf Steiner. Although it was originally designed for small private schools, it was always intended for all caregivers of young children. Specifically, homeschoolers have adapted this method to incorporate a holistic approach to education. The Waldorf method has great emphasis on educating the whole child: mind, body and spirit. For the early years, there is a significant focus on arts and crafts; music and movement; natural science; and, social skills. Older students have an opportunity to develop self-awareness and critical thinking skills. Although this century-old method has been adapted for modern times, the use of technology is not encouraged. In addition, standard textbooks are replaced with journals so students can record their experiences. An interesting component to a typical day in a Waldorf inspired homeschool would include a ‘rhythm’ which has a daily routine of activities. Similar to the rhythm of breathing, inhaling and exhaling, this method endorses a regular routine to give children a natural flow for each day. Activities will vary by age, but it usually includes: reading and writing; storytelling; playtime; math or science; nature walk or trip; crafts; and, helping with meals. This method is also very intentional with a child’s playtime. There are Waldorf-inspired toys specifically created to spark a child’s imagination. Many are simple wooden toys with very little detail, often referred to as ‘open-ended toys’. From wooden blocks, tapestry and dolls with very little facial features, these toys are created to stimulate the child’s imagination and creativity. This method does line up with the beauty of customizing your child’s educational needs. The ability to intentionally use playtime as a learning tool can help early learners transition to academic studies when the time is right. However, with all methods parents should always consider their child’s learning style in relation to their own teaching preferences. 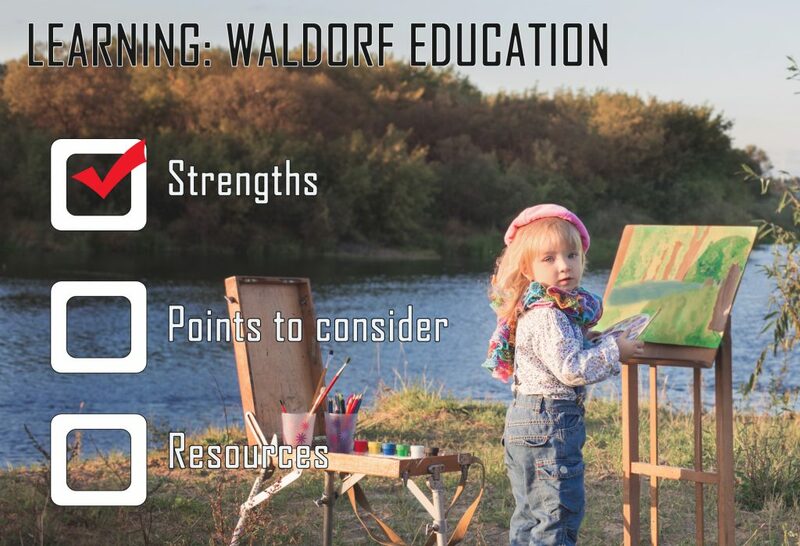 A Waldorf Education is not your typical boxed-curriculum approach to learning. In the early years there is a delayed approach to academics. For many families this could be an ideal method that eliminates any perceived pressure to have preschoolers reading and writing by a certain age. Although technology is discouraged, this method could empower parents to utilize alternative options without relying on screen time for assistance. What Are Homeschool Parents and Children Saying? Angelina P. has been homeschooling her 7 year old son, Keith, from the beginning. Like many parents, Angelina inquired about school for her son during his preschool years, but she didn’t like what she was told. At 3 years old he would have to bus to a distant school since he was diagnosed with Autism. Despite her son being a flight risk, an educational assistant would only be available to Keith for half days and only for three days per week. The school refused her offer to volunteer, so Angelina never sent her son to school. “I started to read books and asked myself, ‘how hard can it be?’” Angelina said. From that day forward Angelina never looked back. As a single mother of a special needs child, Angelina has enjoyed the benefits of incorporating the Waldorf Education method into their homeschool. “The nature walks, open-ended toys and even tracing letters in the sand have all helped my son to focus” said Angelina. Although Keith is considered high functioning in speech, Angelina has also taken the additional step of taking Applied Behaviour Analysis training. This comprehensive training can assist parents with helping their children function within the spectrum. The training combined with a Waldorf inspired education has proven to be beneficial for this family. Angelina has included a rhythm chart to keep a flow to their day and help her son know what to expect. They enjoy simple things like following recipes to support math skills and building confidence. “My son can now transition from one activity to the next,” Angelina said. “At first it was difficult, but now we can successfully move on.” Their schedule is communicated in advance and also displayed through pictures. Although some parents have expressed concern about the cost associated with certain methods, Angelina believes that homeschooling can be cost-effective. “You don’t need to buy expensive curriculums when you can utilize free online resources.” Angelina shared. There are also great alternatives to the Waldorf inspired toys that are out of budget for some families. There are many eco-friendly open-ended toys that still encourage creativity and imagination without the big price tags. Angelina recommends connecting with various homeschooling groups through social media to share ideas and even purchase gently used items. Angelina remains confident that homeschooling with Waldorf is financially sustainable; and, it gives parents the freedom to be creative according to their children’s needs. Although there is a heavy emphasis on having a schedule or rhythm to their day, there is always room to explore personal interests. 7-year old Keith is fascinated with space and has the opportunity to dive into his current interest at his family’s leisure. When asked what he likes best about learning at home, Keith responded that he likes learning about space…in his pyjamas. Whether your children enjoy learning in their PJs or spending time exploring the great outdoors, the Waldorf method is certainly another great option for any family to explore. To learn more about this method and others, visit the CCHE Home Education Methods page. So what’s your family working with? As always, we love hearing from families like yours! Send us an email with your comments, questions and suggestions to: info@hslda.ca.